Group identity refers to the recognition of the group as a distinct unit by both members and nonmembers. Group identity is a critical part of a group’s well-being and much of the behavior of a group will serve to promote and maintain group identity. For example, specific rituals, forms of dress, and speech patterns can help distinguish group members from nonmembers and thus promote group identity. We see this with teenage cliques, religious groups, and even military regiments. 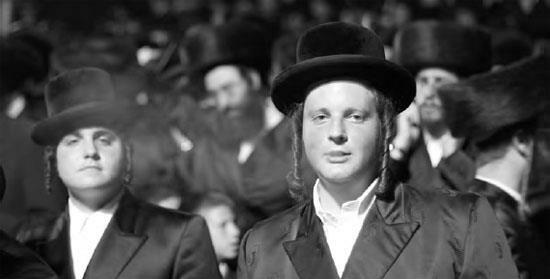 This photograph shows Hasidic or ultra-orthodox Jews. Note the distinctive costume, including black felt or fur hats, long black coats, and long side curls, known as peyos. These outfits mark the boundaries between the in-group and the out-group and play a crucial role in maintaining group identity (Shutterstock).